Offering you a complete choice of products which include Kinox RPD Countertop Paper Dispenser, EP07AC - Auto Cut, Tissue Roll Dispenser, EP 01, Paper Dispenser, EP 02, Paper Dispenser, EJ 01 JRT Paper Dispenser and EJ23 JRT Paper Dispenser. Paper towel dispenser accommodates C-fold and multifold paper towels without adjustment or adapters. Pushthrough design allows loading from the top by pushing towels downward into dispenser through the two hinged towel retainers. Flange - 18-8 S, type-304, 22-gauge (0.8mm) satin finish stainless steel. 1/4" (6mm) 90° return for maximum rigidity. 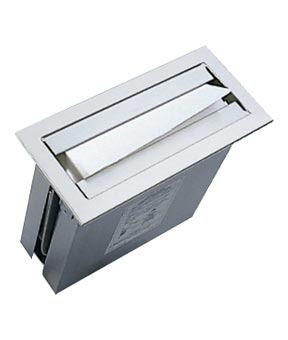 Paper Towel Dispenser - 18-8 S, type-304, 22-gauge (0.8mm) satin finish stainless steel. All-welded construction. Equipped with two hinged towel retainers and a spring-loaded towel tray. Capacity: 300 C-fold or multifold paper towels. Convenient: One-at-a-time towel dispensing reduces waste and ensure hygiene. Free from water splashing. Sanitation: Touchless dispensing helps minimize risk of cross-contamination. Also no paper is exposed outside the dispenser which leads to a more hygienic environment. Cabinet - 18-8, type-304, 0.8mm (22-gauge) stainless steel. Rounded towel tray has hemmed opening to dispense paper towel without tearing. Capacity: 450 C-fold, 600 multifold, or 850 singlefold paper towels. Capacity: 300 C-fold, 450 multifold, or 700 singlefold paper towels. Cabinet - 18-8, type-304, 0.8mm (22-gauge) stainless steel. All-welded construction. Exposed surfaces have satin finish. 18-8, type-304, 22-gauge (0.8mm) stainless steel with satin finish. All-welded construction with beveled opening. Seat Cover Dispensers - Dispenses toilet seat covers from beveled opening. Dispenser fills from bottom through concealed opening. Capacity: 100 toilet seat covers. Cabinet - 18-8, type-304, 22guage (0.8mm) stainless steel with satin finish, which is durable and steady. All-welded construction. Auto Roll Towel Dispenser - Infrared Sensor, Adjustable dispense length. Battery Operated 4 x D Size Alkaline Batteries. Paper Towel Dispenser - 18-8 S, type-304, 22-gauge (0.8mm) satin finish stainless steel. All-welded construction. Outside diameter (139mm), inside diameter (114mm), chute depth (120mm). Cover - 18-8 S, type-304, 22-gauge (0.8mm) stainless steel. All-welded construction. Exposed surfaces have satin finish. Equipped with an adjustable bracket to hold cups, a refill-indicator slot, and a tumbler lock keyed like other Euronics washroom accessories. Secured to mounting plate with a full-length stainless steel piano-hinge. Mounting Plate - 18-8 S, type-304, 22-gauge (0.8mm) stainless steel.